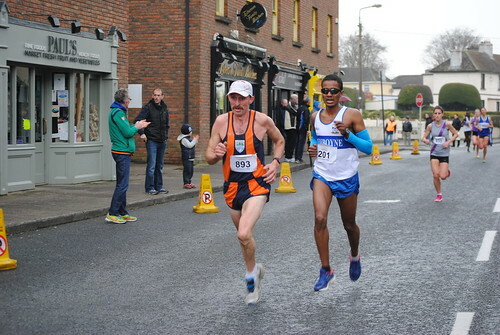 This is a photograph from the 45th running of the Dunboyne 4 Mile Road Race and Fun Run in Dunboyne Village, Co. Meath, Ireland on Sunday 30th of March at 15:00. The event is sponsored by EirGrid. The "Dunboyne 4" lays rightful claim to being one of Ireland's longest and best established road races. It is now a landmark event in the Irish road racing calendar. Henry James once said "It takes an endless amount of history to make even a little tradition". Well the tradition of the 4 Mile Road Race is very safe as witness again today with over 1,000 participants taking part. Today's event yet again showed that it is one of heartbeats of Irish road racing. Reading on a Smartphone or tablet? Don't forget to scroll down further to read more about this race and see important Internet links to other information about the race! You can also find out how to access and download these photographs. The "Dunboyne 4" offers a racing opportunity for everyone from elite international runners, to club runners, to joggers, first-time runners, and walkers. The atmosphere as the race returns to the village at the 2.5 mile mark is one of the best atmosphere's in local Irish athletics as it seems the whole village and associated supporters have come out to encourage the participants. This is a brilliantly organised race with every detail taken care of to the highest standard. This is to the credit of all of the volunteers from Dunboyne AC, Meath Athletics, and the local community of Dunboyne and surrounding areas. It is a race by which others can measure themselves. Dunboyne AC also shows it's committment to growing the next generation of athletes and runners in Ireland by hosting a set of Juvenile Races before the senior event. Based on the final mile of the course there are runs for Ages 9, 12, and 15 year old boys and girls. The race starts at Dunboyne Business Park on the Navan Road (Google Streetview goo.gl/maps/RaS62) and proceeds south into the Village and straight ahead onto the Maynooth Road. The race passed Dunboyne Castle Hotel to the left. The one mile mark is reached at the roundabout where the race turns right and heads across the Village by-pass and towards the Dunboyne Summerhill Road. The two mile mark is just at the next roundabout where the race turns right towards the village again. One of the best parts of the race is the atmosphere as the race passes through the village with the crowds adding to the spectacle. The race must now complete one mile where the runners go along Station road, turn left at Mill Farm Road (near Race HQ) and join back to the race start with a downhill finished into the village (Google StreetView goo.gl/maps/GfK0T).